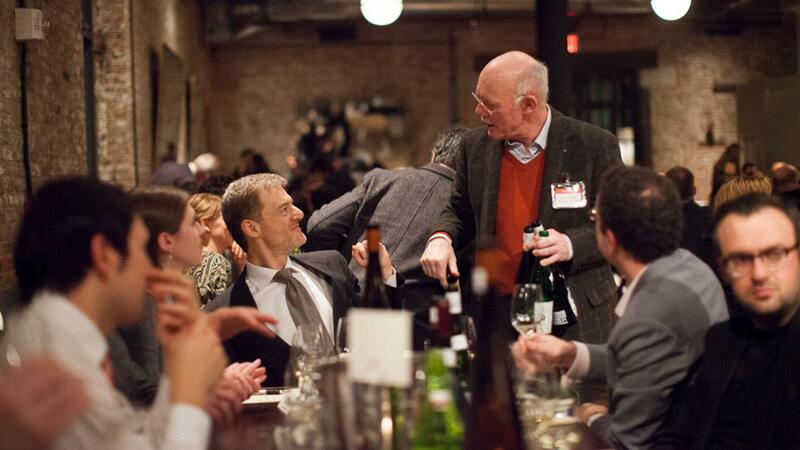 Riesling star Hanno Zilliken (standing) made the rounds at last year's Rieslingfeier. "Bring Riesling to dinner parties!" The plea came from Stephen Bitterolf, founder of vom Boden wine-importing company, who organizes Rieslingfeier, an annual celebration of Riesling now in its sixth year. Producers from Germany and Alsace joined 140 wine lovers who had gathered in New York City from all over the United States. With enthusiasm, the vintners and guests had dug into their cellars for supreme examples, sharing the wines in a day of tastings that culminated in a Riesling-powered dinner. Reynard chef Christina Lecki created a five-course menu to complement and showcase Riesling's broad range of styles, from bone-dry to lusciously sweet, and youthful freshness to complex maturity. The dishes demonstrated the variety's versatility, while the accompanying wines illustrated how different vintage profiles, terroirs and age impact the characteristics of the grape. Dry Riesling pairs well with fish crudo, as exemplified by a duo of 2009s from the Pfalz: Ökonomierat Rebholz Riesling Qualitätswein Trocken Pfalz Ganz Horn Im Sonnenschein GG 2009, one of the wines I brought, and Koehler-Ruprecht Riesling Auslese Trocken Pfalz Kallstadter Saumagen RR 2009 in jeroboam, a contribution from winemaker Dominik Sona. The wines, from a warm but excellent vintage, verified the aging potential of the trocken style. A dish of carrots and vadouvan became even more exotic when paired with Jean Trimbach's contribution: the 1983 vintage of the iconic Trimbach Riesling Alsace Clos Ste.-Hune. This was filled with beeswax, fleur de sel, umami and Asian spice, spiked by powerful but well-integrated acidity. It washed away the flavors of the food, providing palate relief and making us reach for another bite. Smoked chicken served with wild mushrooms, kefir cream and dried herbs came next. An older, sweeter wine, Egon Müller Riesling Auslese Mosel Scharzhofberger 1983, amazed with its complexity and harmony. It exhibited aromas of gingersnap and truffle and flavors of orange blossom honey and coriander matched to its firm structure. Riesling can pair with heartier dishes as well. Whey-braised pork stood out when paired with the silky, expressive Immich-Batterieberg Riesling Spätlese Halbtrocken Mosel Batterieberg 1988, contributed by Gernot Kollmann, who runs the estate. Riesling wines live almost eternally, finely maturing with age. Perhaps this is an audacious statement, but Andreas Spreitzer, proprietor of Spreitzer estate in the Rheingau provided evidence. He poured me a glass of his 1939 Riesling Rheingau Oestricher Eiserberg (labeled as Oestricher Lenchen since 1971, due to a change in appellation regulations) during the cheese course. Selbach-Oster owner Johannes Selbach concluded, "This is why you love, and not only like, Riesling." Based on the enthusiasm at the sold-out event, Bitterolf has been successful in raising the awareness of the quality of German and Austrian wines and Riesling overall. However, one man can only do so much, so you'll see me spreading the gospel, Riesling bottle in hand, at the next dinner party I attend.